On Marathon Day, Sunday, January 19, special traffic controls will be in place from Junkanoo Beach to Paradise Island to Montagu Beach thru Shirley Street to West Bay Street from 5:00 am – 12:30 pm. The streets (downtown – Shirley Street) will be opened on a gradual basis. West Bay Street through Compass Point will remain closed until the last participant has cleared the area. During the road closure, only authorized vehicles will be allowed on the route at the discretion of the traffic police. Traffic rules will be rigorously enforced to keep the event safe for all participants. Please plan ahead and allow extra time for travel on race morning. The average weather in January is absolutely stunning with lows in the 60s (mornings) rising to the mid-70s (afternoon). The humidity averages out to 64%, with the sunrise at 6:53 am EST. GU energy gel will be offered at miles 16 and 22. 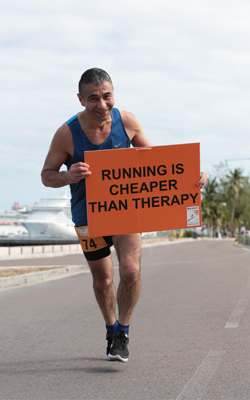 Marathon Bahamas’s Official Medical Team, Doctor’s Hospital, will be at the main medical tent positioned at the finish line. Medical stations will also be positioned along the race course should you need assistance during the race. Authorized cyclists will be on the course monitoring participants who may require medical attention. Should attention be required, the cyclists will notify the medical team. The Marathon is a competitive road racing event. Runners and walkers are encouraged to participate. There will be a 6-hour time limit on the course for the marathon. After the 12:00 pm cut-off period, if you are on the course, you will be asked to move to the pavement should you desire to complete the event. This rule will be strictly enforced. Every participant must be in adequate health and sufficiently trained to partake in this race. Consult your physician before beginning any endurance-training regimen. Need a place to put your dry clothes or car keys? Simply drop your items in the race bag you receive at Packet Pick Up (or your personal bag) and drop your bag at the complimentary Gear Check area near the start line. We recommend that you DO NOT check your wallets or any other valuables into a Gear Check bag. *Make sure to fill out and attach your Gear Check stub located on your race bib. Gear Check will close at 1:30 pm. All unclaimed gear will be donated to a local charity. Transfer arrangements are made at the packet pick-up, January 18, 2020 from 3:00 – 7:00 pm. 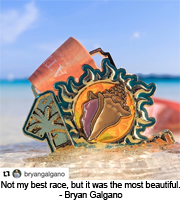 Once you cross the finish line you will receive cold bottled water, your finisher’s medal, go through the Runner’s Food Line for a variety of food selections and pick up your personal belongings from Baggage Drop-Off prior to enjoying the morning at the beach. The Medical Tent is conveniently located at the end of the finish line. 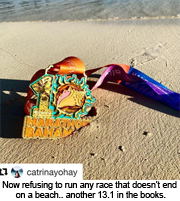 Arawak Cay offers a great venue for all participants to reunite with family and friends, enjoy food, music, vendor displays and cheer other Marathon participants.